1. I draw my image on a large sheet of white paper. In it, I combine ideas from my photographs and memories of favorite places and things, along with personal dreams and inspiration to arrive at a final composition. 2. 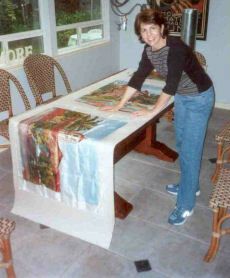 The drawing is placed under a piece of large white silk stretched on a frame. I then apply the thick, glue-like gutta, or resist, directly onto the silk using the lines of my drawing beneath to guide me. This resist process is sometimes referred to as the French serti method. The gutta is applied with a steady hand from a small plastic bottle with a metal tip. This part can be tricky. All gutta lines must be connected. A hair of an opening will result in the dye seeping out. 3. After the gutta dries, I begin painting with the rich and colorful liquid French dyes. The gutta lines will contain the dyes so they will not spread where they are not wanted (like red wine on a white tablecloth). 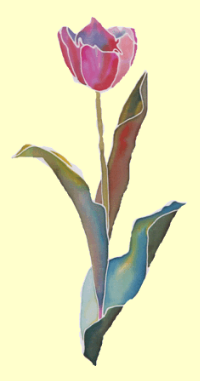 I use watercolor brushes and a watercolor technique to paint the stretched white silk. By carefully mixing dyes, I avoid “muddy” colors and achieve clear, transparent hues. 4. Next, I prepare to steam the silk, which sets the colors and also brightens them even more. I remove the silk from the frame and roll it up between six layers of unprinted newsprint. 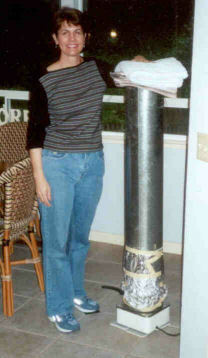 The roll is suspended in a stovepipe over simmering water for three hours. 5. Now I am ready to iron and frame it! 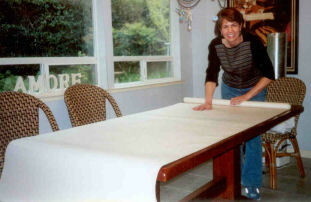 I stretch the silk over acid-free foam core, mat it with museum quality acid-free mats and frame it. At last, it is ready for you to enjoy.